Remember the cherry tomatoes I planted in February (Feb 9th to be exact!)? They have grown so much over the past month! Seriously, I took these pictures a couple days ago, I feel like they're so much bigger already. It's getting really fun! The leaves really smell like tomato leaves! 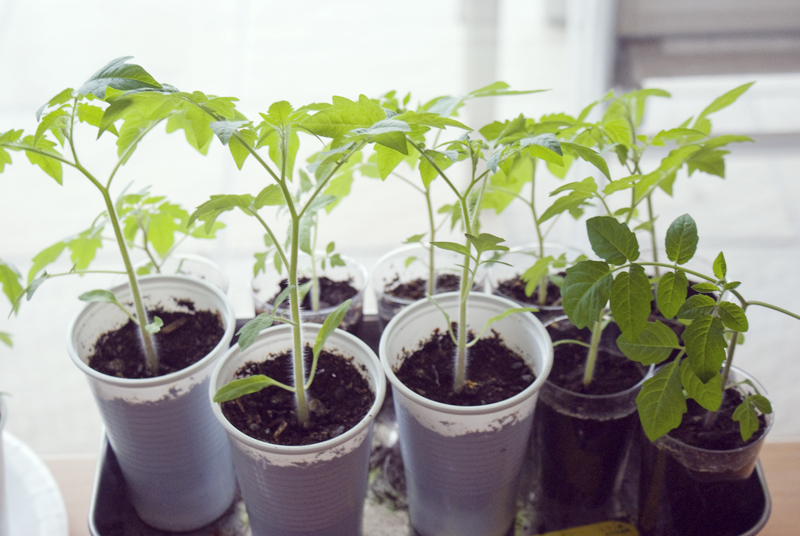 I need to figure out how I'm going to plant them, I'm trying to keep them in these plastic cups for as long as possible, since I can't put them outside yet (it's still so cold!) and I don't want to take up too much room. It may sound stupid, but these little plants give me so much comfort. Even on days when I feel like I didn't get anything done (and sometimes I really don't get anything done, at all), or when I feel like I'm not getting anywhere, it makes me so happy to see these little cherry tomatoes that I planted! And haven't killed (yet...)! To know that they'll keep growing even though my process is stop-and-go feels really good.